CMU, which appears on my list of Nationally Accredited U.S. Institutions with a Vietnam Connection, is something of a U.S. higher education rags-to-riches story. It was formerly Pacific Western University (PWU), an unaccredited school founded in 1977 that received a large and well-deserved share of unfavorable media attention in its day and was the subject of a 2004 U.S. Government Accountability Office (GAO) investigation entitled Diploma Mills: Federal Employees Have Obtained Degrees from Diploma Mills and Other Unaccredited Schools, Some at Government Expense. 1. Only regionally accredited two-year, four-year, and graduate U.S. institutions may be represented at the IIE Fairs. English language and distance learning programs may only participate if representatives are prepared to provide information and answer questions about degree programs on the campus of the regionally accredited universities and colleges of which they are a part. 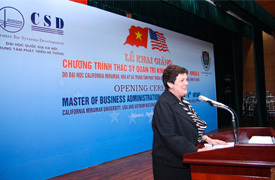 Finally, in terms of representation, I think that an official from Public Affairs or U.S. Commercial Service would suffice for this type of event, making both the U.S. school and its Vietnamese host happy. 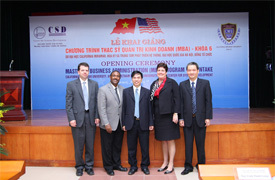 High-ranking officials (e.g., Ambassador, Deputy Chief of Mission, Consul General, etc.) should probably be reserved for events organized by regionally accredited U.S. colleges and universities operating in Vietnam and their local partners. 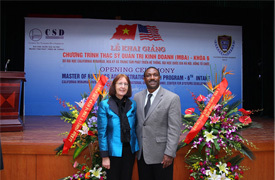 That would send a more balanced message to the Vietnamese government, higher education community and public, as well as U.S. higher education colleagues. 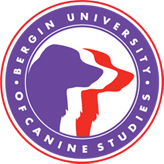 After all, “officially accredited” encompasses a wide variety of postsecondary institutions ranging from the Bergin University of Canine Studies (“the world’s first and only academic institution dedicated to advanced education and research in the timeless human-canine relationship, canine-related businesses and leading-edge assistance dog training and partnerships”) and the Le Cordon Bleu College of Culinary Arts to Harvard University and Stanford University. Not all US institutions of higher education are created equal and national accreditation is not comparable to regional accreditation – not even close. Regional bodies are like a cartel..the lower the supply and raise the price to the point that they are unaffordable…now how practical is THAT?